You can see them from Roan Highlands. They appear when viewed from Linville Gorge and Grandfather Mountain too. The long, green balds that comprise Little Hump and Big Hump Mountains stick out like limes in a grapefruit basket. And, you can see all those other landmarks from the Hump Mountains. The iconic Appalachian Trail (AT) arrives from the Highlands of Roan to traverse these two treeless knobs that stand well over 5,000 feet at their summits. Begin from the headwaters of Roaring Creek, near Spruce Pine. Climb for about ¾ mile on the Overmountain Victory National Historic Trail to reach Yellow Mountain Gap. From there, turn right on the AT and navigate meadows and forests along the spine dividing North Carolina and Tennessee. Prepare yourself to be in awe. My brother Dave, my friend Ken, and I visited the Hump Mountains on Monday, June 6, 2016 beginning at 8:15AM and ending about 3:10PM. Our plan was to take the Overmountain Victory Trail to its meeting with the AT, cross Little Hump and Big Hump Mountains, then return. Hike Rating: Difficult. Strenuous climbing involved. Hike Configuration: Out and back, up and down rollercoaster. Trail Condition: Overmountain Victory Trail is overgrown. Appalachian Trail is in very good condition as always. Some rocky areas, and some trail trenching. Starting Point: Parking area at dead end of Roaring Creek Road. Trail Traffic: We encountered 18 other hikers, including three AT thru-hikers. How to Get There: From Asheville, NC take I-26 W to US-19E toward Burnsville. Go through Burnsville and continue on 19E to Spruce Pine. At the junction with Hwy 226 it is 15.1 miles on 19E to Roaring Creek Road. Turn left and travel 4.8 miles on Roaring Creek Road. The last mile is gravel and dirt. There is enough parking for half a dozen cars. The trailhead is on the right. 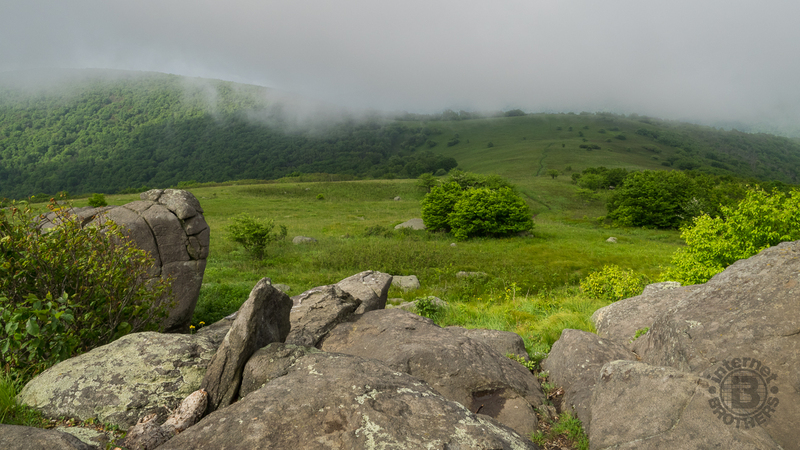 This is a hike I’ve been wanting to do for some time, really ever since I laid eyes on the Hump Mountain pair from atop Grassy Ridge in Roan Highlands. I had been somewhat confused about how to get there without hiking all the way from Carvers Gap, a round trip of well over 20 miles. Many thanks to Brenda Wiley for offering impeccable directions to the trailhead. It made this a very doable day hike. We arrived just past 8:00 after a nearly two hour drive from home. The “we” was my brother Dave, visiting from Colorado, and fellow Meanderthal Ken, my regular and steady companion. 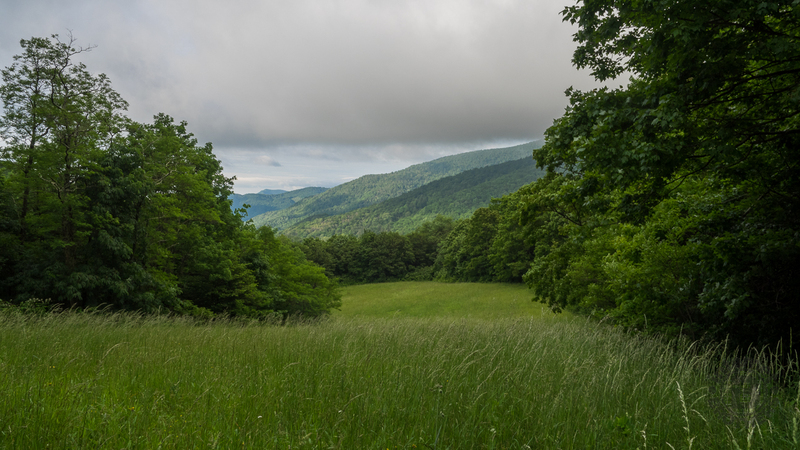 The trailhead for the Overmountain Victory Trail is at the end of Roaring Creek Road, a drive that could not possibly be any farther from anything else. This is really, really out there. All the better… the remote nature of this location made it all the more adventurous. The trailhead is right in the cul-de-sac at the end of Roaring Creek Road, on the right hand side. It’s hard to find the trailhead marker as it’s kind of hidden in the weeds, but there is an old rusty open gate there. We discovered immediately that the trail was already overgrown by summer’s foliage. I could swear (seven hours later when we finished) that the weeds encroaching on the trail had already grown another foot. The old roadbed follows the headwaters of Roaring Creek as it tumbles down from Yellow Mountain Gap. Just past a quarter mile up the hill, the Overmountain Victory Trail makes a hard left turn into an open field. There is a trail marker here, along the treeline. The field couldn’t look more like an old abandoned ski slope if Lindsey Vonn came schussing past. Both Dave and Ken are skiers, and they were wondering aloud about hiking up here with a pair of skis after a winter snow storm. The trail crosses the “ski slope,” then re-enters the woods on the other side to resume the climb to Yellow Mountain Gap. As you near the gap, a side trail comes in from the left, one that goes to an Appalachian Trail shelter. Weary AT thru hikers can use this shelter for overnight rest before resuming their next day. As we approached, we just happened to meet one, a nice fellow who was struggling, but determined. 25 yards later you reach the gap, and the junction with the Appalachian Trail. Turn right here toward Little Hump Mountain. The “ski slope” found as you climb the Overmountain Victory Trail. “To those living beyond the Appalachian Mountains, the American Revolution was a faraway war that had begun in the villages of New England and concerned places like New York and Philadelphia. Most of the “overmountain people,” as they were called, descended from immigrants who had come not from England but from a vast Irish territory known as the Ulster Plantation. These Scotch-Irish had defied King George III’s 1763 proclamation that prohibited private settlements west of the mountains. They claimed the forbidden wilderness for their own, felling trees to clear the land for small farms, building dirt-floor log cabins, growing what they needed and living as they pleased—a people apart. The Overmountain Men are best known for their role in the American victory at the Battle of Kings Mountain in 1780 during the American Revolutionary War. They hailed from parts of Virginia, North Carolina, and what is now Tennessee and Kentucky. On September 26, 1780, the Overmountain Men began their long trek over the Blue Ridge, marching from Sycamore Shoals to Shelving Rock at the base of Roan Mountain, where they camped for the night. After crossing the mountain at Yellow Mountain Gap, they followed a well-worn path up the North Toe River Valley to Bright’s settlement (modern Spruce Pine, North Carolina). For the next mile the AT climbs along the treeline adjacent to large fields of tall plants like angelica, indian plantain, and yarrow. There is a magnificent view of the Roaring Creek valley, although at times it was obscured by morning fog that wafted through the hollow with the breeze. Once you get a couple hundred feet higher, if you turn around, you can see the AT shelter down below. We also saw a lone deer standing chest deep in the field, keeping a close eye on us. We happened upon an oddity: a tree struck by lightning that had split vertically in the trunk. It reminded us of those stilt men you see at carnivals perched high atop 12 foot poles with pant legs all the way to the ground. We called it the “stilt man tree.” It was blackberry blossom season, and we also passed a few blooming wild cherry trees. As we rounded a corner and reached a plateau we got our first glimpse of Little Hump Mountain. This was about to get really exciting. From the moment you can see Little Hump, it is a long steady hike of about a half mile to the summit. Along the way is a gathering of large rocks, a perfect place for our first break of the day. We each grabbed a snack while Dave took about five minutes of time lapse photos of the fog rolling through Yellow Mountain Gap. It created quite the scene, but obscured most of our view of the surrounding mountains. From the rock outcropping near the summit of Little Hump, fog obscures the view. When we crossed to the other side of the summit, the low-lying fog continued. We wouldn’t learn until later, on the way back, what a magnificent view of the southern face of Big Hump Mountain we were missing. Still, it was amazing enough anyway with all the tenuous clouds floating on the wind. We could feel the sun. It was trying to burn off the overcast. We continued on our journey. On the west flank of Little Hump, the AT enters a really cool beech forest. The trees are twisted and gnarled from decades of battling the fierce wind and storms that blow across the Southern Appalachian balds. For the thru hikers, there are a couple campsites and a spring contained within this forest, useful for water resupply. You also lose a few hundred feet of elevation as you drop into the gap between the two Hump Mountains. All the more to climb later. On the other side of the beech forest, we got our first glance at the dignified expanse of Big Hump Mountain, and the sun was shining on its southern face. From this spot, not quite all the way down Little Hump, you can see the complete ascent. Familiarize yourself with what you are approaching, because as you climb Big Hump Mountain you will reach a couple of faux summits that will dash your hopes. Are we there yet? The bare tract up Hump Mountain is imposing. We found another outcrop about a hundred feet up for another break. The nourishment would hopefully steel us for the 500 foot climb up this grand mound. The sky continued to clear. We could now see the summit of Little Hump behind us. We could also see Grandfather Mountain to our east, and the ridges of the Tennessee Smokies to the west. I don’t do climbing steep mountains well. You’ve heard me whine about that before. Ken, however, is a monster when it comes to uphill. I think he gets his lung power from biking. Anyway, he took off on a speed burn and soon became just a blur hundreds of feet above. Dave, on the other hand, is a slow and steady climber. He can go for hours in the twice-as-high Rockies back home, but gradual and quiet. Me, I just suffer. But, we all made it. Some 30 minutes later, there we all stood on the 5,587 ft summit. There were others enjoying a picnic lunch, so we continued a little bit down the north face to a plaque honoring Stanley Murray on Houston Ridge. Murray, quite the conservationist, was instrumental in bringing the Appalachian Trail to Roan Highlands. Now, it was time for lunch. We sat down on a rock outcrop and breathed deeply. From Houston Ridge we could see Little Hump in the foreground, with the Roan Highlands behind. The views are astounding. The clouds, now puffy whites, had lifted enough to recognize the surrounding landmarks. 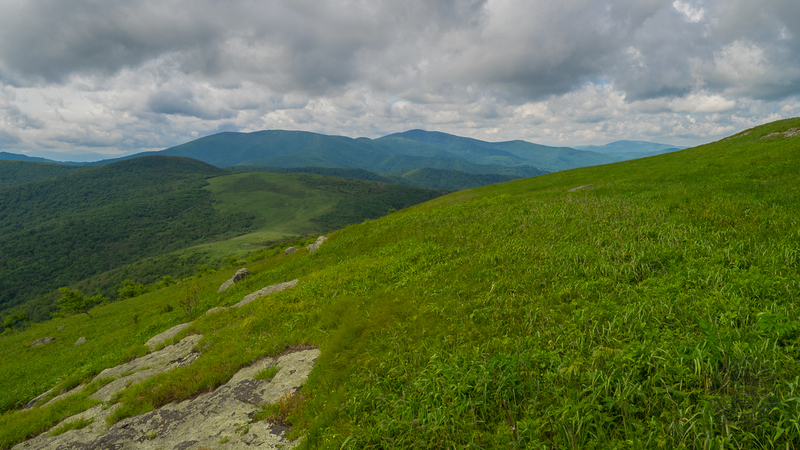 Each of the balds of Roan Highlands were distinct. This was now the opposite view of what had intrigued me about the Hump Mountains. It was every bit as fantastic as I envisioned. Grandfather Mountain and Linville Gorge are in plain view. I’m not as familiar with the mountain ranges on the Tennessee side, but they are all there to behold. We stayed for probably a half hour. Even then, I still didn’t want to leave, but we had three hours of hiking and a two hour drive ahead of us. The return trip was remarkable. Everything we couldn’t see earlier in the morning was now in plain view. There were also now more hikers out enjoying the stellar day, including a couple more thru hikers, and our old pal we had first encountered back at Yellow Mountain Gap. He was hiking his own hike, steadily plodding along. There were more wildflowers now in bloom in the afternoon sun. The birds were in full chorus, including what we later learned was a red breasted grosbeak… a loud and persistent fellow. The climb from the gap between the Humps back up Little Hump was a whole lot easier than summiting Big Hump. After we cleared the beech forest on the upward side and turned around, there it was — what we had missed in the morning fog — a magnificent view of the whole of Big Hump Mountain. You will see it in the photo gallery below. We didn’t dawdle though. Ominous dark clouds were building over Grandfather Mountain and the recognizable Hawksbill and Table Rock at Linville Gorge. We certainly didn’t want to be on a bald mountaintop if the clouds started waging war. The section between Little Hump and Yellow Mountain Gap seemed longer on the way back. Perhaps we were just a bit apprehensive about approaching bad weather. No worries though… we made it back to the car without a drop of rain. Best Hike How to summarize the brilliant day we all had? This is a hike you must do. If you aren’t in shape, get yourself fit. It is soooo worth it. Allow plenty of time to enjoy everything the Appalachian Trail through the bald Highlands has to offer. So get there early in the morning. Take some good friends so you have others to share the wonderment with. Keep one eye on the weather, but be sure your other is tuned to the absolute magnificence that is the Hump Mountains. I consider this trip to be a best hike, and think you will too. Here is a video my brother Dave put together of our adventure to the Hump Mountains.